The last of the Christmas pudding has been eaten, the decorations are stashed in the loft, and things are feeling a little flat. All that’s left for the next few weeks is to hit the gym and lay off the Prosecco in an effort to repair the excesses of the season. Or, you could distract yourself with holiday browsing. Travel bookings are at a high in the aftermath of the festive season, and as brochures start to land on your doormat, the choice is vast. 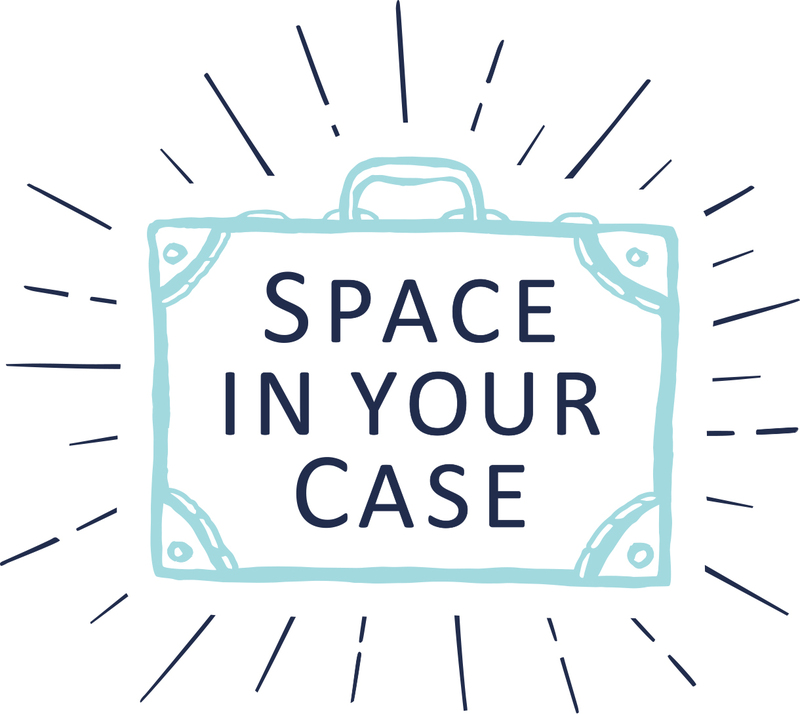 Helen, here at Space In Your Case, has always been a fan of self-catering campsite holidays with the kids in Europe, often a more affordable option for the big two-week summer break. However, she’s recently returned from Beaches Resorts in Jamaica, where she became a huge fan of the luxury all inclusive holiday option. If you’ve always considered them too much of an expense, you might be interested to read why she thinks the higher cost is worth it. 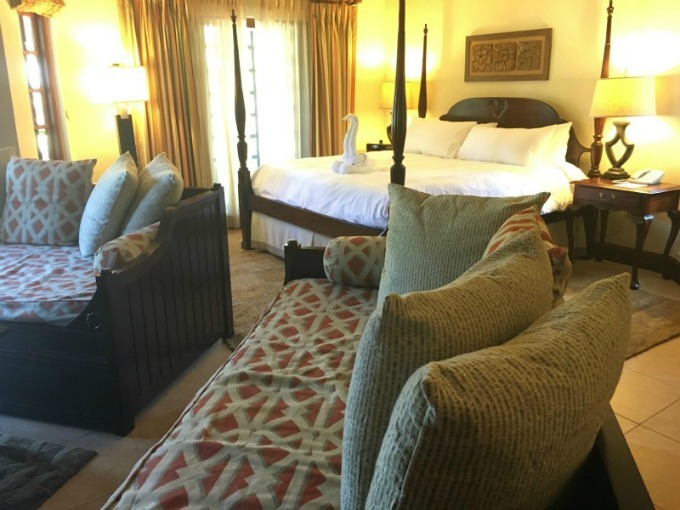 “That didn’t feel like a holiday,” my husband declared, on our return from our first trip as a family of three. “It did for me!” I retorted, thinking of the cooking I hadn’t done, the nappies I hadn’t changed, and the tupperware boxes I hadn’t tidied away 16 times a day (does everyone have one of these cupboards for their baby?). The truth is that once you become a parent, someone else doing some of the work of looking after your young child, makes you feel like you’re on holiday. A big part of any holiday is the food. Our family love to eat; we like to indulge, experiment, and explore local tastes. We like wine with our meals, we love restaurants, and there’s nothing better than a cocktail as the sun sets. We dig in with gusto everywhere we go, but the most wonderful thing about our holiday dining at Beaches was not having to pay. Normally we sit in restaurants and fancy, but don’t order the lobster, the Chateaubriand, the Sancerre. We have the smaller steak, the plaice, and a beer. Then we question whether the kids really do need an ice-cream, while we scrutinise the bill, and wonder how much we can get away with tipping. And there’s nothing wrong with this approach. It teaches us to self-moderate, and it shows the children how to manage their money. But there is something so wonderfully uplifting about choosing whatever attracts you on the à-la-carte menu, knowing that you’ve paid for it already in the price of your holiday – even the tips. 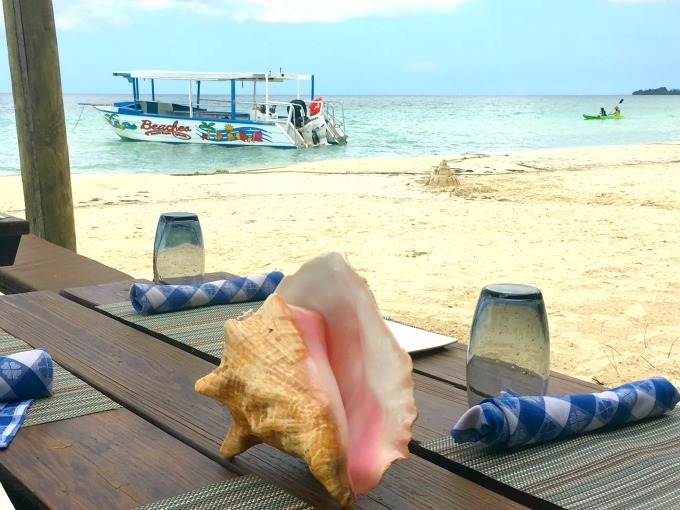 We didn’t overeat, or drink too much, we just relaxed and thoroughly enjoyed our food, our surroundings, and our family as we dined at Beaches, instead of worrying about the damage we were doing to the credit card, and if we were going to run out of cash. I’d pay for that pleasure without a moment’s hesitation. An all inclusive holiday should offer you more of what you need. Still on the food, and admittedly, a feature which may vary from holiday to holiday, the staff at Beaches Resorts were incredibly flexible with our needs. We had some dietary requirements, which I emailed to the resort management prior to our arrival. As soon as we arrived the head chef brought us a sheaf of paperwork detailing nutritional content in some of the restaurants’ key dishes. Also impressive was the appearance at our table of staff wanting to know if there was anything we would like preparing specially for us or our children. Nothing seemed to be too much trouble, and had we wanted a boiled egg and soldiers to go with our lobster, I’m confident they wouldn’t have batted an eyelid. Rooms were spacious enough for a family of 4, the mattresses and bedding were super-comfortable, and the air-conditioning worked perfectly. That’s what you get when you pay for a luxury all inclusive holiday. I’m the world’s biggest fan of sleeping on a narrow, thin mattress in a caravan for the sake of a fun-packed week on a campsite, but for comfort and relaxation you can’t beat a luxury all-inclusive holiday. Beaches Negril had thought of everything, right down to smaller robes for the children. The sun loungers on the beach had thick padded cushions, and all the restaurant tables had a great view. Don’t take toiletries to a Beaches Resort; they provide complimentary shampoo, conditioner and shower gel from their on-site Red Lane Spa, and replenish it whenever you need it. Pool and beach towels are provided, so there’s less bulk in your suitcase, and the hotel towels are a lovely quality. 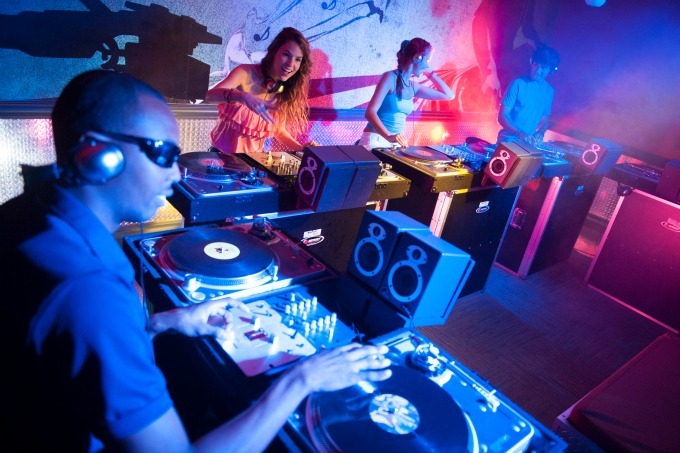 Most holiday providers have a kids club, and lots have some form of entertainment. But if your children are fans of one thing, and not another, sometimes you don’t make use of all the facilities on site. At Beaches there was so much for the children to do, that neither of them ever got bored. From mini-golf and a play park, to learning scratch DJ skills (an additional cost), there was a complete range of activities to keep them busy, should they ever tire of the pools and water parks. My children are not currently fans of kids clubs, but they were both tempted by the Beaches facilities, and we were particularly impressed with the offering for teenagers. Everywhere we went at Beaches was clean, right down to the staff raking the sand every morning. Pool toilets are notorious for feeling unpleasant, but these were regularly cleaned, and most of the time dry. Birds are a problem near tropical food outlets, but the staff kept them away from tables as much as possible, and I never once saw a fly near the buffet food. 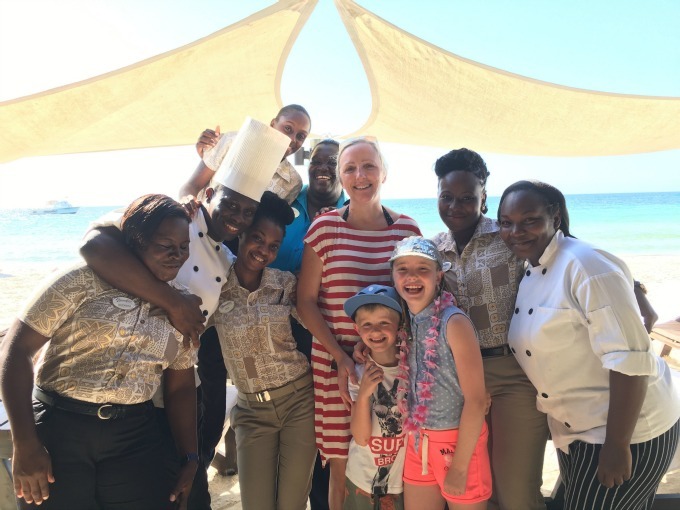 It’s not just drinks and snacks from the bar that are included in the price of your holiday; the complimentary mini-bar in our Negril suite was replenished daily with soft drinks and water, meaning I didn’t have to worry about the safety of the water for the children – we had plenty. As we were in a concierge suite, we also had complimentary wine, beer, and sparkling wine in our fridge, and there was no limit on that. Just the thing after a long hard day at the beach, when you’re getting ready for dinner! And the housekeeping staff delighted our children every day by settling their bedtime bears to play with the towel animals. The kids clubs were all grouped together, in clean, air-conditioned rooms, with plenty of good quality furnishings and toys. (See our Katie’s review of the Beaches Resorts childcare here). 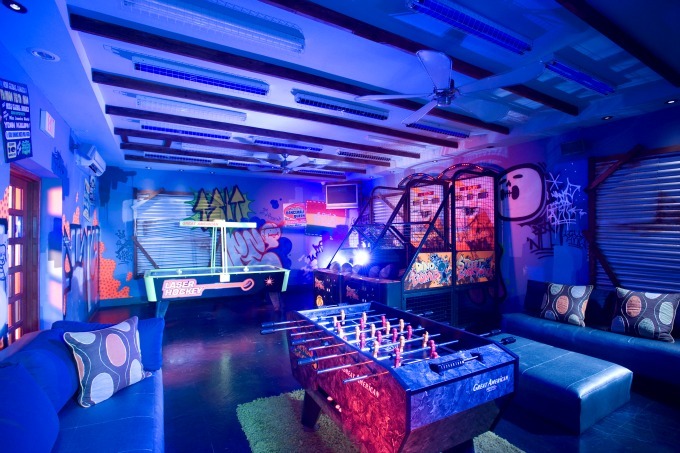 What we loved most though, having older children, was the fact that the tweens and teens night club – aptly named Trench Town – was right next door to the adult bar Liquid, while the Xbox Play lounge was just downstairs. Knowing the kids are safe, with supervision, and happy, means you really can get time off as a parent and relax in your own setting. Another thing that drains money from your wallet on holiday is the extra cost of fun activities. 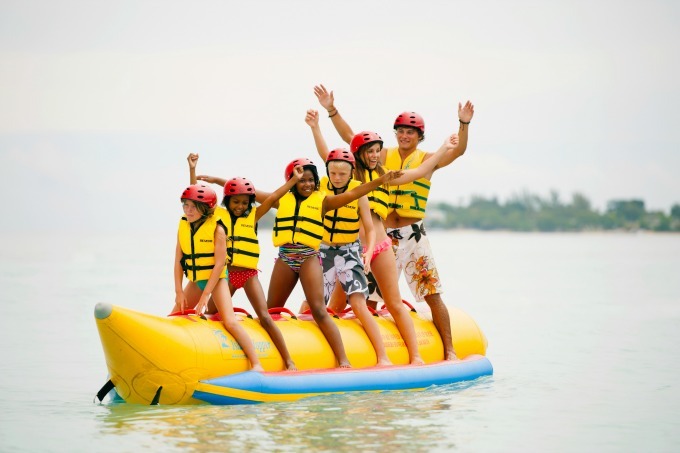 I can’t tell you the amount of times we’ve said no to our kids when they’ve begged to ride a banana boat, go kayaking, or learn to sail, simply due to cost. Activities on holiday have to be rationed unless we want to return home to a huge bill. Not so with a good all-inclusive. They had the best time riding the Wildcat, paddle-boarding, and snorkelling with guides, while my husband learned to water-ski. You can even have a scuba diving trial in the pool at no extra cost at Beaches (although a PADI course will cost extra). 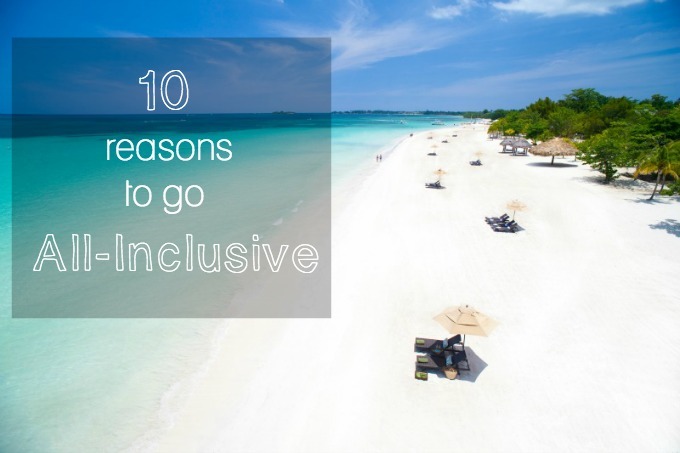 There are very few restrictions or hidden costs on a luxury all-inclusive holiday. At Beaches this meant that my 11 year old daughter was able to indulge in a massage at the Red Lane Spa, at the same time as me. Of course, this was an extra cost, but whereas in the UK she has to wait until she’s 14 to join me on a spa day, they welcomed her in Jamaica, and booked us in for a double treatment so we could enjoy a treat together. Whilst their usual offer for children involves painted nails, they had no problem accommodating our requests. Of course, a luxury all inclusive holiday is not something every family wants, or can afford. However, depending when you travel, there are some really good deals to be had, and when you add the cost of food, transport, entertainment, and extra activities to your self-catering alternative, you might find it’s worth considering an all-inclusive holiday for your family. We travelled with Beaches at October half-term, which is low season in the Caribbean, so prices for that week were more affordable than you might think. Helen’s stay at Beaches Negril was courtesy of Beaches Resorts. Seven nights’ accommodation at Beaches Negril Resort & Spa costs from £5,735 for a family of four (2 adults and 2 children). Price includes Luxury Included® (all-inclusive) accommodation in a Negril Premium Double Room, return economy flights from London Gatwick with Virgin Atlantic and return resort transfers. Subject to availability and valid for travel in June 2016. To book or for further information on Beaches Resorts call 0800 597 0002 or visit www.beachesresorts.co.uk. I’m coming round to that way of thinking too Donna. Yes it feels like a lot of money when you book it, but actually, in terms of what you get, it’s really good value. I definitely read that they can make you happier too, as they take the guilt factor out! This was the best part for us Penny. We just didn’t think about anything else other than relaxing and enjoying what there was on offer. That was wonderful for everyone. The kids adore the wildcat, but it’s such an expensive activity that you could only ever justify doing it once on a normal holiday. Here they did it every day and talked about it all the time. So lovely to indulge. We are trying to work out where to go on our first foreign family holiday and what type of holiday to go on. Whilst I would absolutely adore to go where you went I am realistic and know that it’s hugely over our budget but I also know that we could manage an all inclusive holiday to somewhere like Greece or Cyprus. Unfortunately the husband isn’t convinced and is adamant that going self-catering and eating in local restaurants will save money. I’m going to show him this post I think! If we don’t decide soon we won’t be going on a foreign holiday at all! You could also show him my credit card bill Rachel, from several of my European trips! That’s what convinced me. By the time we added up travel, cash withdrawals to cope with eating and daily expenditure, and supermarket bills, we were pretty close to the price quoted in this post! I think all-inclusive is a great option for families looking for a relaxing holiday. One thing I love about them is that the children get to try lots of different local foods – you can let have a little try rather than having to order a whole plateful and then pay for it when they don’t like it!